Following right after the end of Configured, Avlyn finds herself in New Philadelphia. But instead of attaining freedom, she has become a prisoner of the president, Warren. A team of people will help her train her skill of immersing into computer systems, with the plans of using her in the future as an ultimate weapon. She doesn’t trust any of the people around her, so when Elore attacks New Philadelphia, she uses the chaos to escape unnoticed. Now she has several factions after her, all of them wanting to control her ability. This book is filled with fast-paced action and cool technology. When the characters aren’t fighting in the real world, they’re exploring the limits of the computer world. There was also a bit of a love triangle, which was fun to watch unfold. I’m not a huge fan of main characters who are ‘the chosen one’ and have the best and most powerful superhuman skills, but I had already read Configured and knew that Avlyn’s ability would be featured in the second installation of the series. Immersed gives a much wider view of the Configured world, and I enjoyed exploring it with Avelyn. If you like young-adult dystopian novels, you will definitely want to check out the entire Configured series. I have a bit of a rant about one of the tropes in this book, but I didn’t want to get it mixed in with the review. So even though I’ve given Immersed a good rating, I still want to call out this common character attribute which seems to have made me irrationally angry. Avlyn has an annoyingly strict moral code. In any instance of danger, she has to save all the people. Whenever there is an attack, she needs to personally run out and warn everyone. If someone is lagging behind, she will drag them along to safety. There is no consideration for the greater good, Her ability uniquely qualifies her to end the war, which means that putting herself in danger also jeopardizes the future of humanity. But instead of seeking an end to the fighting, she must rescue the closest person who is experiencing any sort of threat. I know that some adults also cling to this simplistic view of morality, but my argument is that this character trait can be counterproductive to telling a story. There are plenty of detective novels where the stubborn main character must always do the right thing, but in this case, their do-good-ness commonly interferes with their personal life, constantly driving them away from friends and family and inviting harm to themselves. But in stories for young adults, plucky teenagers who always do the right thing don’t have negative consequences when they run back into the fray to save some little kid. Their desire to do good is always successful and won’t result in personal injury. Why does this particular character trait bother me so much? By ‘always doing the right thing,’ the main character has lost all agency. The reader already knows what the character will do in each new situation because the character’s strict morality dictates all of their actions. This robs the protagonist of ever having to make any meaningful choices or hard decisions—you know, the things that make characters interesting. 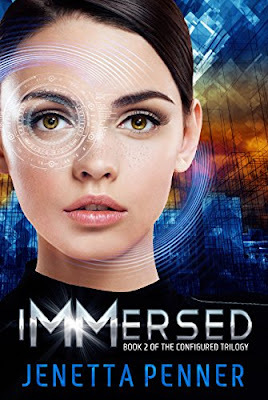 To give Immersed some credit, even though Avlyn’s actions are formulaically predictable, the characters around her are able to point out the flaws in her thinking. However, they also tend to cave to her desires—but at least they’re aware! A lot of writers struggle with making their characters too reactionary and failing to give them tough decisions. I believe that strong traits which take away a character’s ability to make a meaningful choice are just as detrimental to the story.